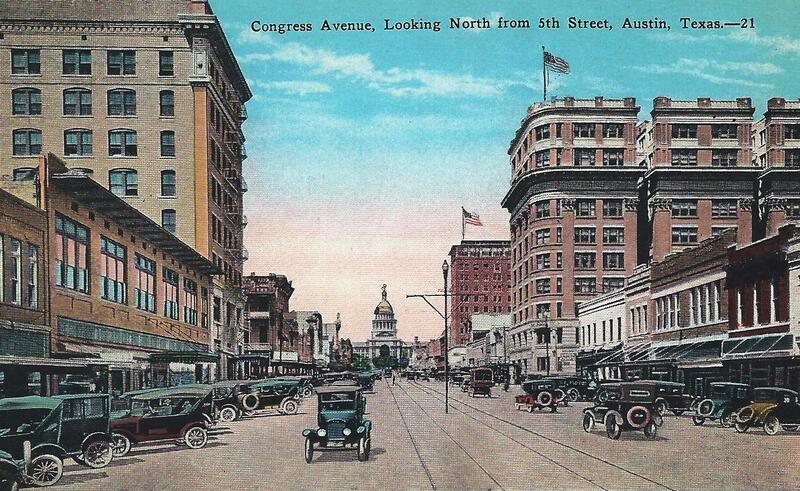 Above: Congress Avenue in downtown Austin around 1916. 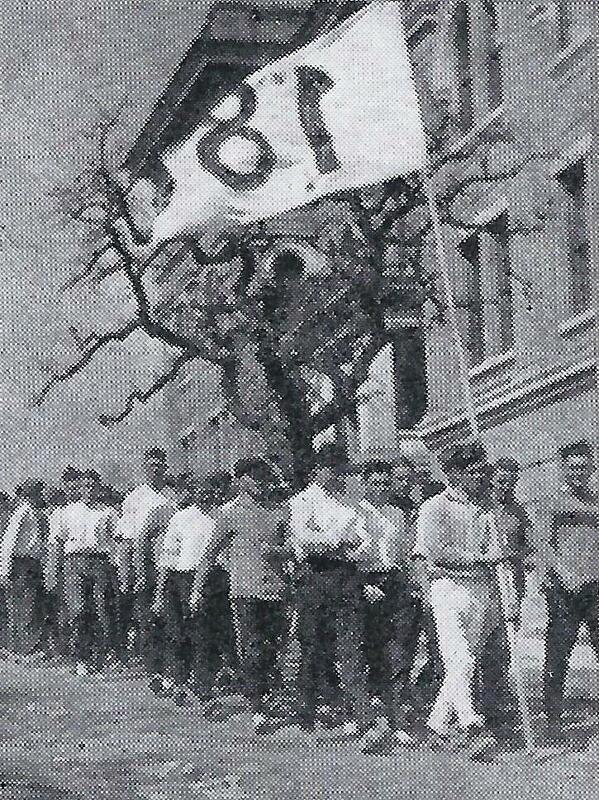 A century ago, in 1916, Texans viewed March 2 – Texas Independence Day – as something like a national holiday. School children had a break from classes. Most of the stores, banks, and even the U. S. Post Office, were closed. Above: The University of Texas campus in the 1910s, seen from University Avenue. On the University of Texas campus, Texas Independence day was a little less noisy than in years past, when a cannon was borrowed from the Capitol grounds and repeatedly fired in front of the old Main Building, which almost shattered the windows. Instead, a 10 a.m. convocation was held in the auditorium of Old Main. 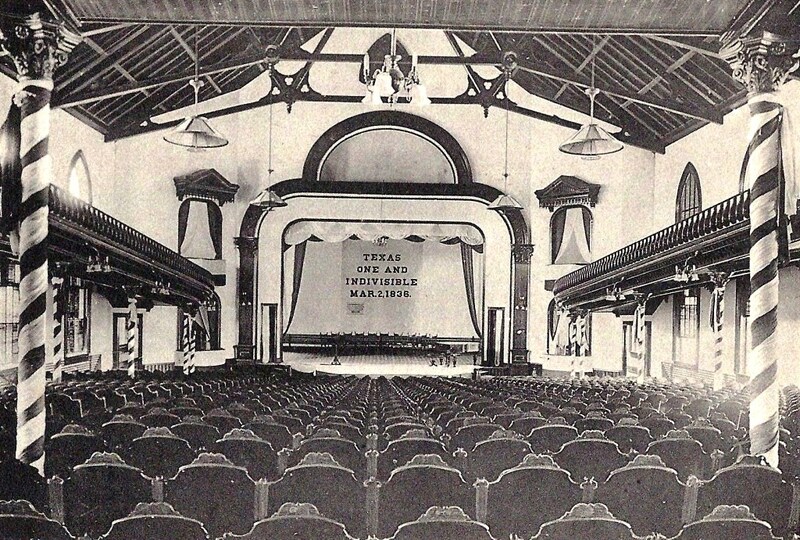 The University Band provided music, the senior class – decked out in the caps and gowns they would wear for graduation in a few months – attended as a group, and speeches were made in appreciation of the history of Texas. Thomas Taylor, the Dean of Engineering, spoke on behalf of the faculty about “The mission of the University of Texas,” and quoted former Republic of Texas president Mirabeau Lamar about the necessity of having a well-educated populace. Taylor commended the students and declared they were “pioneers of the colleges of the world” in establishing student self-government “in the independent Texas spirit of 1836.” The assembly ended with the singing of The Eyes of Texas. Above right: The auditorium in Old Main, decorated for the March 2nd convocation. After the convocation, the crowd went directly to Clark Field, the University’s first athletic field, then located at the southeast corner of Speedway and 24th Streets (about where the O’Donnell and Gates-Dell Buildings are today), where the popular pushball contest between the freshman and sophomore classes was just getting underway. 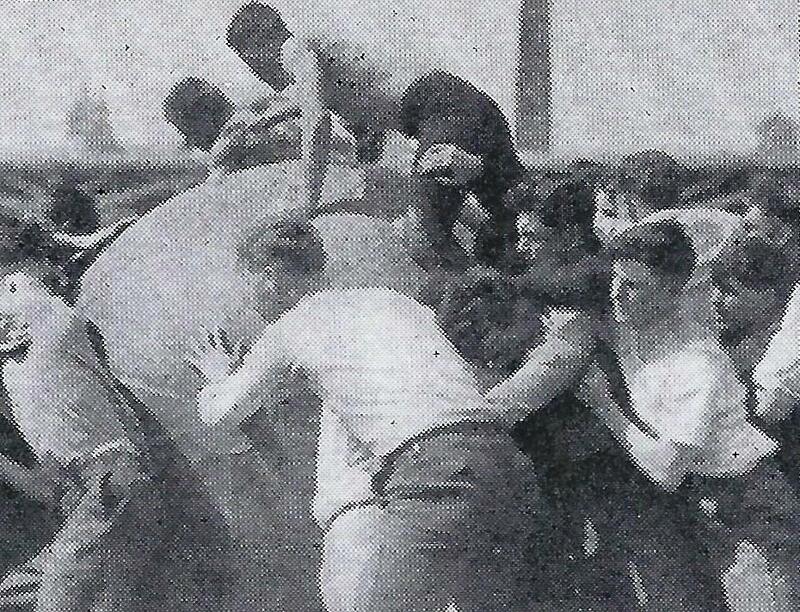 Introduced in 1912 as a new University tradition, the pushball was a six-foot diameter round leather ball, often compared to an overgrown soccer ball, which weighed about 65 pounds when fully inflated. Played on a standard football field , the object was to push, carry, roll, toss, or by some other means move the ball across the opponent’s goal line. Blocking and tackling were allowed, holding and fighting were illegal. Above left: The sophomore class of 1918 marches past the old engineering building (today’s Gebauer Building) on their way to the pushball contest with the freshmen. Above and below: The 1916 Pushball Contest on old Clark Field. With a large crowd watching from the stands, the pushball contest was divided into four 10-minute quarters. The first quarter permitted every male freshman and sophomore student on the field, more than a thousand persons all at once. (Sorry, ladies. In 1916, while women were playing tennis, basketball, and field hockey on campus, pushball was considered too rough for UT co-eds.) The second quarter was limited to 100 persons on a side, then reduced to 50 persons for the third quarter, and the final period was once again a free-for-fall for everyone. Though the first and fourth quarters were scoreless, the sophomores managed a goal each in the second and third periods, and won the game 2 – 0. At noon, the Austin chapter of the UT alumni association met at the Driskill hotel downtown for its usual Texas Independence Day lunch. More than 80 alumni enjoyed speeches and songs, and received telegrams from alumni chapters in Fort Worth, Lubbock, and Chicago, who were meeting at the same time. 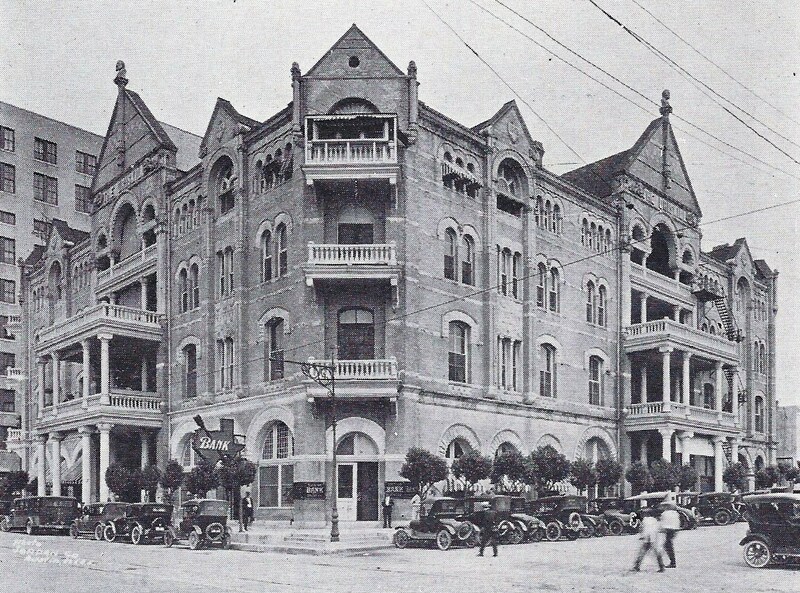 Above: The Driskill Hotel on Sixth Street. The most publicized event, though, was in the evening, when the Dallas and New York alumni chapters met for their annual March 2nd banquets in each city. 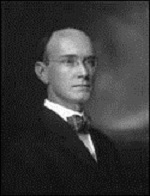 Developed from an idea that originated with the New York alumni, the two events were to be connected through a long distance telephone call, and linked to Austin as well. “The small matter of 2300 miles of space,” reported the Austin Daily Statesman, “will not prevent the University of Texas alumni associations of Dallas and New York from holding a joint session on the evening of March 2nd to celebrate the independence of the Republic of Texas.” While there had been long distance calls between New York and San Francisco, and President William Taft had once addressed a group of Yale alumni in New Haven from the White House, what was about to be attempted had never quite been done. The 30-year old American Telegraph and Telephone Company loaned “about a million dollars’ worth of equipment” to the effort. As the attendees of both banquets arrived – about 200 persons in New York and 300 in Dallas – they discovered a “watchcase receiver” next to each setting. About the size of a pocket watch with a wire attached, the receiver was held up next to the ear to listen to the telephone conversation. Promptly at 8 p.m. in New York (and 7 p.m. in Dallas), the telephone line was opened. Three guest speakers each from Dallas and New York briefly addressed both groups. Among the trio from New York was Sidney Mezes, the immediate past president of the University. At about 7:40, UT President William Battle (photo at left), sitting in Room 2 in the Driskill Hotel and surrounded by a few local alumni, joined in on the conversation. “Dr. Battle was seated at a table talking just as a guest in the hotel would talk from his room, without the seclusion of a telephone booth,” marveled a Statesman reporter. Battle chatted with Mezes about the day’s events and who won the pushball contest, and then segued into a formal address to both groups. Battle spoke about the ongoing war in Europe (one the United Sates would join the following year) and the importance of universities to train public leaders and protect democracies in troubling times. “Did you hear me all right,” Battle asked when he finished his address. “Just fine,” was the answer in New York, “Fifteen Rahs for Dr. Battle!” The alumni in both cities cheered, and then said good night. Great job of digging and writing, Jim. This is all news to me and I’m glad to know about the early conference call. Happy March 2nd! !